1.5 lakh person killed in road accidents last year. Road accidents in India decrease by 4.1% during 2016, fatalities rise by 3.2%. The youth have become largest victim of road accidents in the country. 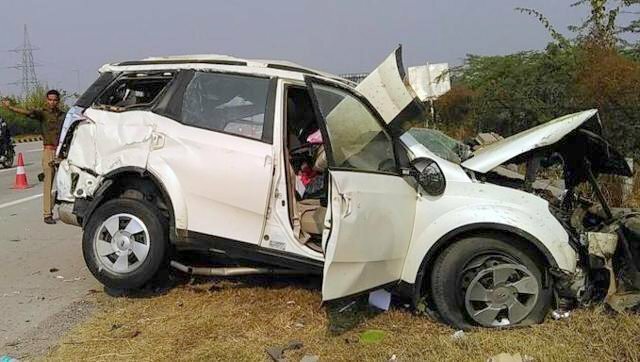 Out of total 1.5 lakh people killed in road accidents last year, nearly 50 percent (46.3% to be exact) were youth between the age group of 18 to 35. New Delhi: According to a government data released, the youth falling within the age group of 18 to 35 accounted for 46.3% of the total over 1.5 lakh person who got killed in road accidents last year. The Road Transport ministry which released the data today also said that last year more than 4,80,000 (four lakh eighty thousand) road accidents were reported in which nearly five lakh persons got injured. The number of persons killed in these accidents had increased by 3.2 per cent over the previous year (2015). On an average 1,317 accidents and 413 accident deaths take place on Indian roads every day, the road ministry added. However releasing the Data minister for Road, transport and highways Nitin Gadkari said that road accidents in the country have decreased by around 4.1% during 2016, with the year seeing 4,80,652 road accidents as against 5,01,423 in 2015. Though fatalities resulting from these accidents have risen by about 3.2% during the same period. Nearly 1,50,785 persons were killed in 2016 as against 1,46,133 in 2015. Releasing the Ministry’s annual publication ‘Road Accidents in India-2016 the Minister for Road Transport and Highways, Shipping, Water Resources, River Development and Ganga Rejuvenation Nitin Gadkari said that while the accident and fatality figures still leave a lot to be desired in the matter of ensuring road safety, the trends are encouraging. Gadkari also informed that the positive trend of 2016 is further bolstered by the accident figures for the first half of 2017, where there has been a 3 % reduction in road accidents between January to July 2017, along with a 4.75 % reduction in road accident fatalities. While road accidents have come down from 2,43,870 between January to July 2016 to 2,36,458 during the same period in 2017, fatalities have come down from 79,354 between January to July 2016 to 75,583 during the same period in 2017. Road accidents deaths have reduced in 25 states and Union Territories in the first half of 2017. Only states like Assam, Bihar, Orissa and Uttar Pradesh seen increase in road accident fatalities between 2-8 % during this period. During 2016, 13 States accounted for 86 per cent of the total road accidents in the country . These are Tamil Nadu, MP, Karnataka, Maharashtra, Kerala, UP, AP, Rajasthan, Telangana, Gujarat, Chhattisgarh, West Bengal and Haryana. Similarly, 13 States accounted for 84 per cent of the total persons killed in road accidents during 2016. These are UP, Tamil Nadu, Maharashtra, Karnataka, Rajasthan, MP, AP, Gujarat, Telangana, West Bengal, Punjab, Haryana and Bihar. The fifty Million-Plus Cities accounted for 18.7 per cent in total road accidents in the country, 11.8 per cent in total persons killed in road accidents and 16.7 per cent in total persons injured in road accidents. Chennai had the highest number of road accidents (7,486) while Delhi had the highest number of deaths (1,591)) due to road accidents. Accident severity for the combined 50 Million Cities was 19.8 in 2016 as against 14.9 per cent in 2015. According to the publication, the age profile of road accident victims for 2016 reveals that the youth of age group 18 – 35 years accounted for 46.3 per cent (69,851 persons) and age group of 18-45 accounted for a share of 68.6% (1,03,409 persons) and working age group of 18-60 accounted for a share of 83.3 per cent (1,25,583 persons) in the total road accident fatalities. The number of road accidents relative to population, registered vehicles and road length are on a general declining trend from 2010. Number of accidents per lakh population declined from 42.5 in 2010 to 37.9 in 2016. Number of persons injured per lakh population decreased from 44.8 in 2010 to 39.0 in 2016. Number of persons killed per lakh population marginally increased from 11.4 in 2010 to 11.9 in 2016. The National Highways accounted for 29.6 per cent of total road accidents and 34.5 per cent of total number of persons killed. As compared to the previous year i.e, 2015 road accident has gone up on National highways from 28.4 per cent to 29.6 per cent in 2016. The State Highways accounted for 25.3 per cent of total accidents and 27.9 per cent of the total number of persons killed in road accident in 2016. About 37 per cent of total accidents took place on traffic junctions with 72.9 percent on uncontrolled ones, underscoring the importance of traffic control mechanism at junctions. Potholes accounted for 6,424 Road Accidents & 2,324 fatalities. 9,583 accidents & 3,396 accident deaths were attributed to speed breakers. Among the vehicle categories, two wheelers accounted for the highest share in total number of road accidents (33.8 per cent), followed by cars, jeeps and taxis (23.6 per cent), trucks, tempos, tractors and other articulated vehicles (21.0 per cent), Buses (7.8 per cent), Auto-Rickshaws (6.5 per cent) and other motor vehicles (2.8 per cent). The share of two wheelers in total road accidents has increased from 28.8 per cent in 2015 to 33.8 per cent in 2016. Road users on two-wheelers are the most vulnerable; constituting 34.8 per cent of total persons killed in 2016. The other road users killed in road accidents are cars, taxies, vans and other light and medium motor vehicles – 17.9 per cent; trucks – 11.2 per cent; pedestrians – 10.5 per cent; buses – 6.6 per cent; auto rickshaws – 4.7 per cent; and others motor vehicles – 10.6 per cent. Based on the data reported by Police, drivers’ fault is single most important factor responsible for road accidents (84 per cent), killings (80.3 per cent) and injuries (83.9) on all roads in the country during 2016. Intake of alcohol/drugs by drivers resulted in 14,894 road accidents (3.7 per cent) and 6,131 fatalities (5.1 per cent). The act of talking on mobile phones while driving has resulted in 4, 976 road accidents, 2,138 road accident deaths and injuries to 4,746 number of persons during the calendar year 2016. Overloaded vehicles caused 61,325 (12.8 per cent) road accidents and 21,302 (14.1 per cent) deaths in 2016. Gadkari informed that his Ministry has adopted a multi-pronged approach to ensure and promote safety on roads. These include use of road engineering measures to enhance safety, improved vehicle safety standards, education and awareness for drivers and general public, enforcement of road safety laws and post-crash response and trauma care facilities. The MoRTH has identified and rectified many accident black spots. Total 789 black spots were identified of which 140 spots have already been rectified, 283 are under execution/bidding and 228 under survey investigation. The Motor Vehicles (Amendment) Bill 2017 which is in Parliament. provides stricter penalties for traffic offences for increased compliance and will go a long way in making Indian roads safer. The Minister also said that a district level committee will be constituted under the chairmanship of local Lok Sabha MP in every district to monitor road security, to identify black spots, to suggest road security measures etc. This committee will also involve and take help of local polytechnic students in improving the road conditions of the district.